The Holocaust in the Independent State of Croatia refers to the genocide of Jews and other ethnic minorities during World War II within the Independent State of Croatia, a fascist puppet state ruled by the Ustaše regime, that included most of the territory of modern-day Croatia, the whole of modern-day Bosnia and Herzegovina and the eastern part of Syrmia (present-day Serbia). 90% of Croatian Jews were exterminated in Ustaše-run concentration camps like Jasenovac and others, while a considerable number of Jews were rounded up and turned over by the Ustaše for extermination in Nazi Germany. The Independent State of Croatia was proclaimed by the Ustaše on 10 April 1941. Within the new state lived approximately 40,000 Jews, only 9,000 of whom would ultimately survive the war. Actions against Jews began immediately after the Independent State of Croatia was founded. 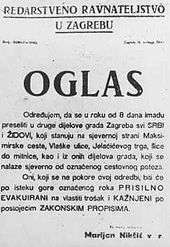 On 10-11 April 1941 a group of prominent Jews in Zagreb was arrested by the Ustaše and held for ransom. On 13 April the same was done in Osijek, where Ustaše and Volksdeutscher mobs destroyed the synagogue and Jewish graveyard. This procedure was repeated in 1941 and 1942 several times with groups of Jews. 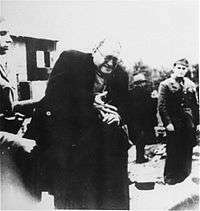 Already in April 1941 the Ustaše established the concentration camps Danica (near Koprivnica) and Kerestinec, where along with communists and other political opponents, the Ustaše imprisoned Jews. In August 1941 the Ustaše established the Jasenovac concentration camp, one of the largest in Europe. This included the Stara Gradiška concentration camp for women and children. The United States Holocaust Memorial Museum (USHMM) in Washington, D.C. presently estimates that the Ustaša regime murdered between 77,000 and 99,000 people in Jasenovac system of camps between 1941 and 1945. The Jasenovac Memorial Site quotes a similar figure of between 80,000 and 100,000 victims. Of these, the United States Holocaust Museum says that at least 20.000 were Jews. The Jasenovac Memorial site lists the individual names of 83,145 victims, including 13,116 Jews, 16,173 Roma, 47,627 Serbs, 4,255 Croats, 1,128 Bosnian Muslims, etc. Of the total 83,145 named Jasenovac victims, 20,101 were children under the age of 12, and 23,474 were women. The destruction of the Sephardi synagogue in Sarajevo was carried out by Nazi German soldiers soon after their arrival in the city on 15 April. The Sarajevo Haggadah was the most important artifact which survived this period. The demolition of the Zagreb Synagogue was ordered by the Ustaše mayor Ivan Werner and was carried out from 10 October 1941 to April 1942. The two Jewish football clubs in the state, ŽGiŠK Makabi Zagreb and ŽŠK Makabi Osijek, were banned in 1941. Many historians describe the Ustasha regime’s mass killings of Serbs as meeting the definition of genocide. Some racist laws, brought from Germany, in addition to Jews and Roma, were applied to the Serbs. Vladimir Žerjavić estimates that 322,000 Serbs were killed in the Independent State of Croatia, out of a total population of 1.8 million Serbs. Thus one in six Serbs were killed, which represents the highest percentage killed in Europe, after the Jews and Roma. Of these Žerjavić estimates that about 78,000 Serbs were killed at Jasenovac and other Ustasha camps. According to the United States Holocaust Memorial Museum in Washington, D.C., between 320,000 and 340,000 Serbs were killed in the NDH. The Ustasha regime launched the persecution of the Roma in May 1942. Whole families were arrested and were transported to the Jasenovac concentration camp, where they were immediately, or within a few months, killed. Estimates of the number of victims vary from 16,000 (this figure is given Vladimir Žerjavić) to 40,000. The Jasenovac Memorial at Jasenovac, Croatia lists the names of 16,173 Roma killed at that concentration camp. Due to their way of life, many more victims are probably unrecorded. The German historian Alexander Korb and the United States Holocaust Memorial Museum in Washington, D.C., both estimate at least 25,000 casualties among the Roma, which represents nearly the total Roma population in the Independent State of Croatia. ↑ Michael Phayer, The Catholic Church and the Holocaust, 1930-1965, pg. 34, Bloomington, Indiana University Press, 2000. ↑ "Concentration camp "Uvala Slana", Pag island". ↑ "'U NDH je rješeno židovsko pitanje'". Jutarnji list. Retrieved 17 April 2014. ↑ Ivo Goldstein. "Uspon i pad NDH". Faculty of Humanities and Social Sciences, University of Zagreb. Retrieved 20 February 2011. ↑ Samuel Totten, William S. Parsons (1997). Century of genocide: critical essays and eyewitness accounts. p. 430. ISBN 0-203-89043-4. Retrieved 28 September 2010. Wikimedia Commons has media related to The Holocaust in the Independent State of Croatia.